Another month has flown by, and what a month it has been for craft projects on the blog! From Kathy’s wonderful Memory Hoop, to Elle’s twist on a classic Millionaire’s Shortbread, there’s been so many ideas to try. With so much inspiration on the blog in May, we’ve decided to round it all up into one article for you to read through, bursting with crafty highlights! We’re sure that you’ll also find a wonderful template or free download for you to use along the way. Keep reading to find out our Top 9 crafts from May, as well as the winners of our Monthly Competition, Craft of the Month, and Project of the Month! We kicked off the month with a totally roar-some set of dinosaur-themed papers. Ideal for Father’s Day, these papers feature dino patterns, prehistoric footprints and cool sentiment toppers – all perfect for creating some amazing, unique projects. Merging scrapbooking and home décor, lots of you enjoyed Kathy’s Memory Hoop tutorial. A creative way to display your memories, the Dovecraft Lost & Found collection really lends itself to this make! Sweet caramel, salty pretzels and bittersweet chocolate – probably three of our favourite flavours combined! Elle’s twist on millionaire’s shortbread will not only be a great treat for Father’s Day, but any other celebration too! Capture your baby’s first year in month-by-month with these adorable DIY Baby Milestone Cards. Simply create this set of twelve cards, one for each month, and take a photo of your baby together with each card as they grow. Not only will you be able to see how your baby has changed from image to image, you’ll be left with a selection of photographs to help you celebrate all of your baby’s special milestones! Late this month, we showed you how to create a DIY handbag gift bag with our video tutorial! With a few simple cuts and scores, you’ll be well on your way to making this in no time! They’re perfect for adding a thoughtful finishing touch to gifts and you can mix and match designs and paper to suit your celebration. With Father’s Day not long away (17th June), we thought we’d show you how to create your very own Father’s Day wallet craft, filled with vouchers to be redeemed. This would make a really thoughtful handmade gift and it’s so easy to create with the Perfect Allusion papers from First Edition. Find our free printable full of vouchers to stash inside your wallet too! Michelle showed you how to create this adorable ‘Little Box of Positivity’ using a matchbox and the wonderful Let’s Celebrate papers. Filled with little tickets that are adorned with positive and inspirational messages, this little DIY is perfect for when you need a pick me up! This month we were so excited to tell you all about our brand new partnership with the mental health charity, Mind. We’re going to be supporting our new partnership across our website and social media, and we thought we’d begin by showing you how to create your own Mindfulness Jar. This month, we showed you how to get the most out of your embossing folders by showing you how to create three wonderful projects, including a trinket bowl, pen pot and fun dimensional card. Perfect for those of you who like to get the most out of your craft supplies! Which projects have you enjoyed creating from the blog this month? Have you spotted one since reading this post that you’d love to try? Leave us a comment below letting us know your thoughts, we love to hear from you! Are you ready to find out who’s won this month’s Craft Challenge, Project of the Month and Monthly Competition? Read on to find out! For this month’s Craft Challenge we asked you to create your own Royal Wedding card. We had so many wonderful entries, but this one by Dido really stood out for us. Congratulations! Every month, we get so many amazing projects uploaded to the Inspiration area by you! We do look at them all and we really appreciate all the hard work that goes into creating these items. Each month, we pick our favourite project to win Project of the Month, and May’s lucky winner is Claire Gladman. We love these adorable Lantern Jellyfish. Congratulations! Thank you to everyone who entered our competitions this month. 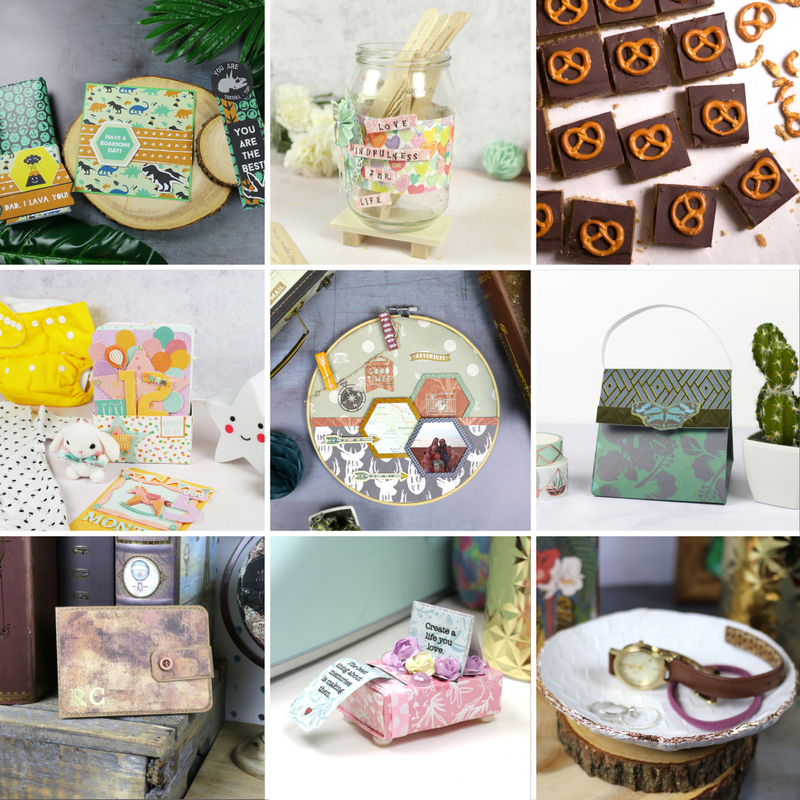 We have plenty more chances to win in June, so keep your eyes peeled for more and don’t forget to keep uploading your projects to the Inspiration area! Well done everyone hope you all enjoy your prizes. Great projects by the winners this month as always. Congratulations to all winners, especially to Diana and Claire for their beautiful projects. Congrats to the winners, enjoy your amazing prizes! First of all a biiiiig congrats to all the lucky and well deserved winners here this month. And next it has really been an amazing month filled to the brim with amazing and gorgeous projects, and I only regret that I didn´t have any time to play with all these ideas, but many of them is saved and being tryed later, but I was sooo busy with makings for my granddaughters confirmation, which is all over now, sio hopefully I´ll be able to do a lot more of the fun things this month, and I really look forward to play with some of all the amazing projects, you guys share inhere. Hope everyone will have an amazing June now filled with fun and summer. Wow! Awesome projects!!! Congrats to the winners!! !